It doesn’t matter if you want them or not, most android phone manufacturers will definitely fill up their phones with bloatwares and unwanted apps. If you would have tried uninstalling these apps, then definitely you would have found out the hard way that most apps that come pre installed on your android phone cannot be deleted easily. This is where you can take advantage of rooting your android phone. 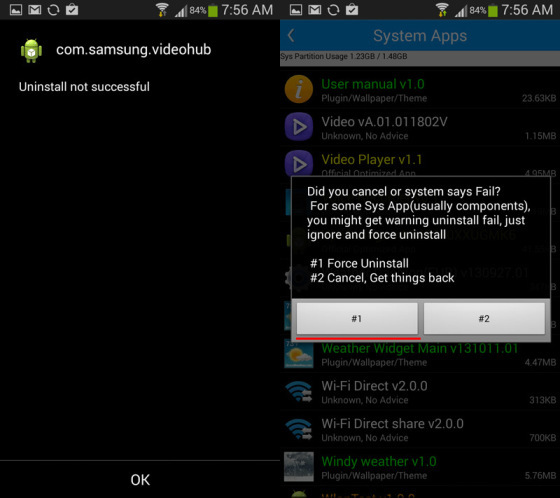 A quick Google search will land you on numerous how to guides that will help you out with rooting your android phone. In case your android phone is not much popular, you can try out Framaroot, an easy to use and one click root application for most android phones ( Works great on unbranded Chinese android phones ). Framaroot should be your last alternative in case you cannot find a proper guide on rooting your android phone. If you have successfully rooted your android phone or in case you already have an rooted android phone, you can make use of Root app delete, an free android app to uninstall and delete any any pre installed apps / bloatwares from your android phone. The app is a free download from the Google play store and does its job pretty well when it comes to removing unwanted apps from an android phone. Here are the detailed instructions to remove / uninstall unwanted apps and bloatwares from your rooted android phone using the Root App Delete app. 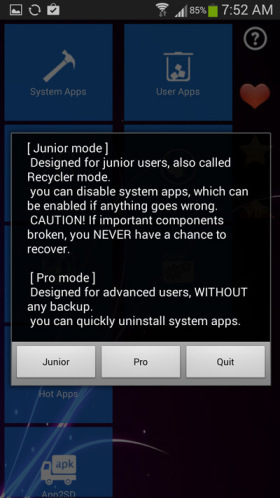 Step 2: Tap on System apps and tap on Pro when prompted to choose from Junior or Pro mode. Step 3: Scroll through the list of system apps and tap on any of the apps which you want to be removed from your Android phone. Note: Make sure the app you are going to uninstall is not a system app, otherwise installing a system app would make your android phone unstable. 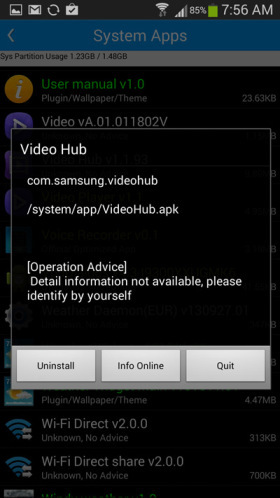 Step 4: Next tap on Uninstall to remove the unwanted app and again tap on OK to confirm your selection. Step 5: In case the app cannot be remove properly, you will see the following error. Tap on OK and then tap on #1 to force uninstall the app. Now the unwanted app / bloatware will be removed from your android phone. Check your apps menu to confirm it. Follow the same process to remove other unwanted apps and bloatware from your android phone.